When we get too caught up in the hustle and bustle of this fast-paced world, we can lose our appreciation for the little things that make us feel good. How can we reclaim it? By focusing on the sensations that bring our bodies pleasure throughout the day. 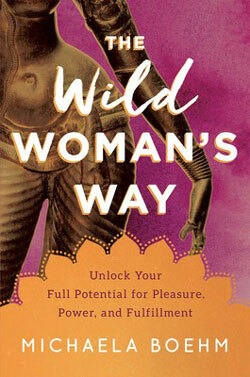 Michaela Boehm, author of THE WILD WOMAN’S WAY, shares the 5 ingredients for a sensual life. See. Hear. Touch. Smell. Taste. These are the five simple ingredients for a sensual, pleasurable life. We engage with the world through our senses, but often in modern life our bodies respond with irritation or numbness to the overwhelming sensory input to which we are exposed. “See” registers to our nervous system as clutter or excessive computer in flow; “hear” flinches at loud traffic noise; “touch” becomes irritation, as people bump against us in the subway; “smell” reacts to exhaust fumes and perfumes; and “taste” tolerates quick convenience foods. When the stimuli are consistently too high, our body will try to narrow our sensory perception. Eventually, our nervous system will numb to sensations and only the “loudest” will register at all. Lowering sensory aggravation is one obvious strategy to feeling more. Developing a stronger nervous system is another. There are practices for both, to help us feel more in the moment, and to gradually make a lifestyle change, which you can find in section IV: “Sacred Practices of the Wild Woman,” pp. 197–236. However, sometimes life circumstances just aren’t conducive to quiet, and not everyone can relocate to the serene countryside or a Himalayan cave. There is a sensual pleasure to feeling one’s body and engaging in activities that awaken the senses, and it is always available to us. We can use everyday life to sensually enliven us and bring us back to feeling and our bodies. By bringing active and conscious attention to our five senses throughout the day, we train our body to become sensually enlivened, and we redirect our sensitivity toward pleasure. Wherever you are, find things of beauty and joy to look at. If you spend consistent time in one place, such as your office or a place in your house, you can create specific displays that give you pleasure when you look at them. (See section IV: “Sacred Practices of the Wild Woman,” pp. 197–236.) Or you can seek out and focus on anything in your visual field that creates a positive sensation in your body. The key is to focus on something you enjoy rather than something that disturbs your nervous system. Get yourself a pair of noise-canceling headphones and listen to recorded sounds of nature or music you enjoy on the train, in the gym, or anywhere else you find appropriate. Make playlists that you choose to give you sensual pleasure. If you can, find a quiet place to sit and enjoy the peace and give your hearing a break. Or, if you can go into nature, focus on the rustling of wind in the trees, birds singing, or the sound of a stream or ocean. Focus on the different sounds and then let them melt together and become like a gentle massage. Feel your world through your hands. Touch the different textures of your surroundings consciously and notice what sensations they produce. Notice what happens when you wrap your hands around a warm teacup or a glass of ice water. Carry a small, smooth stone or ridged shell you can touch in your pocket. Caress the fur of an animal and the soft hair of your child, and delight in the sensations. Before you take a bite of your food or a sip of your drink, inhale its scent. As you inhale, imagine the scent moving into your body. Let the smell register, and notice how your body reacts. Wait until you can feel your body’s reaction before you eat or drink. After you have thoroughly enjoyed its scent, take a bite of your food and taste it deliberately. Notice where in your body the taste registers, and any emotions you might feel. Eating is a deeply sensual and emotional act, and the more you are smelling and tasting, the better your relationship with your food and your body will be. For more practical rituals and exercises to help you switch between the “go-mode” and “flow-mode” of a modern woman, pick up a copy of Michaela Boehm’s THE WILD WOMAN’S WAY. Ready to make a change? Learn how to choose happiness and live the life you intended. Excerpted from The Wild Woman’s Way by Michaela Boehm. Copyright © 2018 by Michaela Boehm. Used by permission of the publisher. All rights reserved.